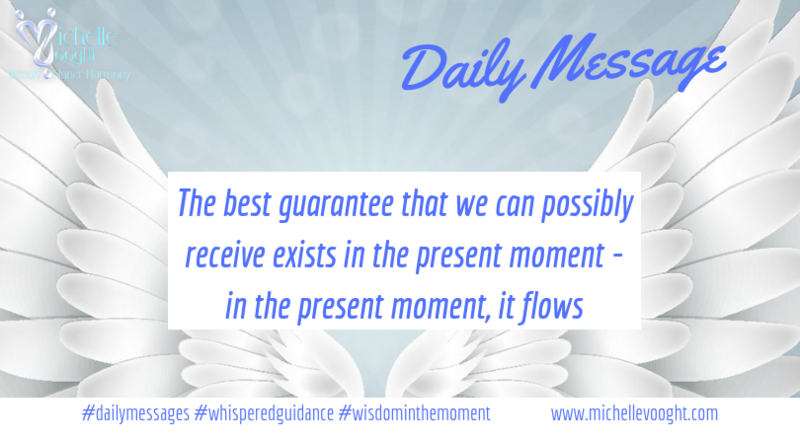 For today, we are guided to go with the flow…sometimes we worry unnecessarily because we run away with things in our mind…the best guarantee that we can possibly receive exists in the present moment. Allow yourself to be in the flow of what is happening in your life at this time. It may seem as if life is hitting you from all angles. Perhaps it seems like everything is going wrong at once and nothing is working out for the good. The more we focus on what is going wrong, the more we create resistance. The more we try to bully our way forward, irrespective of what is going on around us, the more we are continuously swimming upstream, going against the grain. What we resist, persists; what we accept, flows. Go with what is, accept what is happening right now and don’t judge it as anything other than the flow of life. Move it into acceptance – the less energy we give it, the less energy it will attract and the sooner it will go away. Allow life to happen …. it shall pass. Focus on the blessings and gratitude with each difficulty and see how it disappears and expands into even greater blessings.